My wife Nancy and I were staying in the scenic village of Deia on the Spanish Mediterranean island of Majorca a few years ago. It was raining and at midweek not many were out and about. We stopped for a beer at Sa Fonda, a quaint little bar with a terrace overlooking the valley, before going to dinner. Only half a dozen people were in the place, but in one corner sharing a round of Guinness with his mates was the actor Colm Meany. No big surprise seeing a celebrity–after all this is the hideaway town (p0pulation less than 800, most of whom are expats) of Michael Douglas and Catherine Zeta Jones, Tim Robbins and Susan Sarandon, and a host of others. In Spain dinner starts late and it was 9 p.m. when we walked across the street to an inconspicuous little restaurant called Sa Dorada. It was even less crowded than Sa Fonda. Only two other tables had people at them. Sitting at the table closest to us was a striking looking woman who reminded my wife of Edwina of Absolutely Fabulous comedy fame dressed as a gypsy. Her long, flamboyantly curly dark hair was tied back by an enormous purple scarf. She wore a long skirt, a peasant blouse and a long necklace. Her eyes were dark, her lips were bright red and she brimmed with life. She was joined by a slender man in his late fifties whose gray hair was as curly as hers and a quiet youth in his mid-twentie’s. Half way through dinner the woman who was Australian engaged us in conversation. Her name was Frances. At some point we mentioned we had unsuccessfully tried to find Robert Grave’s burial plot that afternoon. “I think we can help you,” she said. Then she proceeded to introduce us to her husband, the gray-haired gentleman, who was Juan Graves, the son of the famous novelist/poet. The young man, Brendan, was Robert Graves’ grandson, Juan’s son. Frances went on to say that she was an artist and Juan was a jazz musician who had always lived in Deia. This was making for a pretty extraordinary night, but there was another surprise to come. When we told them we were from Kansas City, Frances’s eyes widened and, pointing to the the only other people in the room, exclaimed “So are they!” Hearing that, a lady at the other table looked at me and said “Aren’t you the owner of Bloomsday Books back home?” Indeed, I am, came the answer. Turns out she was the ex-wife of Jim McKinley, former head of the creative writing program at the University of Missouri at Kansas City. 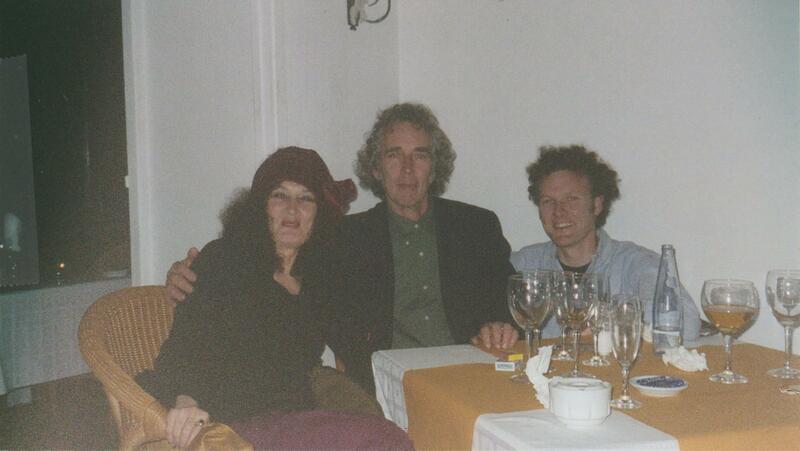 Years ago she and Jim spent his sabbatical in Deia to interview and do research on a biography of Robert Graves. They fell in love with the place. It was a time when cottages were quite affordable and they bought one. She kept it after the marriage ended. After dinner Nancy and I crossed the street back to Sa Fonda where Juan had gone to play bass in a jam session. The place had filled up with a fascinating looking crowd of expats–alas, Colm Meany had departed–and we stayed for the first set. Then we waved goodbye to our once-in-a-lifetime new friends and drove the winding road a mile and a half to the cozy little hotel (it’s called Sa Pedrissa) overlooking the Med. 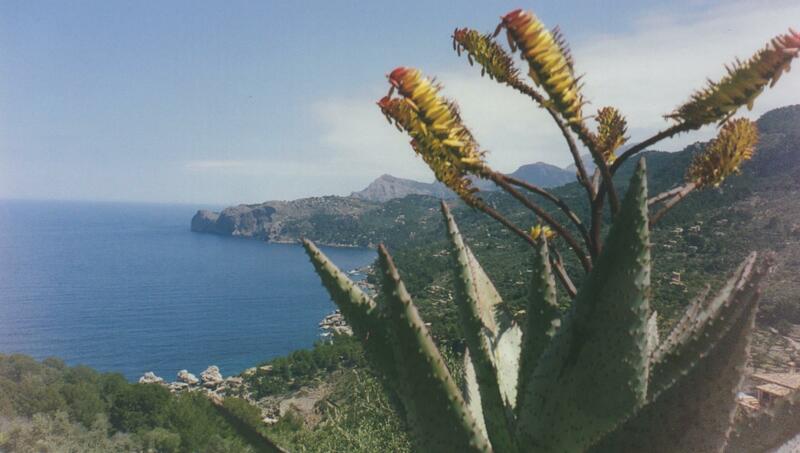 It was in 1929 that the British writer Robert Graves (I, Claudius), settled in Deia. He was fleeing his wife with his lover, the poet Laura Riding. He spent most of the remaining 55 years of his life there. His presence there attracted such friends as Kingsley Amis, Ava Gardner, Alec Guinness, Anais Nin and a young Gabriel Garcia Marquez. Once an affordable haven for artists and writers, more affluent celebrities have found the place and prices have skyrocketed. Nonetheless, it’s a great place to visit and you never know who you’ll run into at Sa Fonda listening to Juan Graves playing bass in a jazz session. I first met Duncan Christie-Miller in the blistering summer of 1973 at Camp Lejeune, North Carolina. He was a British Royal Marine officer on exchange to our elite Marine Force Reconnaissance Battalion. I had just arrived fresh from officer training at Quantico and the Navy Justice School. It was the tail-end of the Vietnam War and virtually all Marine troops had returned stateside from Vietnam. Many were disillusioned and bitter and racial tensions were high. It was the wild west and the fourteen of us young judge advocates at the Division’s legal office tried more felony cases in six months than the Air Force did in a year. Cases ranged from larceny at the P.X. to astoundingly brutal murders. I was getting lots of great legal experience, but I needed an outlet to get away from the demanding workload. One evening I was having dinner at the Officer’s Club with Mike Wheeler, a graduate of the Naval Academy, when we noticed the Royal Marine sitting alone. We had seen him a year earlier when he presented a rappelling demonstration at The Basic School. He had the charming elan and expertise that the military Brits seem to have in abundance and it was one of the few lectures I can recall during that six month training period that I didn’t feel like drifting off. “Wheels” called him over to share a drink with us. We got to talking rugby football and got Duncan to help establish and coach our club. The Lejeune Lions didn’t exactly tear up the rugby pitch, but we did manage to beat an Army side from Fort Bragg. During a match in Norfolk, Virginia, we were outclassed by a team that consisted of Navy Seals and some civilians just off the boat from Ireland. When they heard Duncan’s accent he was in for it and took some poundings before some of our Marine recon players replied in kind. As he was going under one particularly violent pile Duncan was heard to shout “You hashish-smoking bastards! !” Why he happened to come up with that was anyone’s guess, but it did provide for a few laughs at the post-party. That was 38 years ago and while I’ve lost track of “Wheels, ” Duncan and I remain close friends. Although separated by half a continent and the Atlantic Ocean we’ve managed to get together over the years and share old stories and bring each other up to date on new experiences. He lives in London and when he’s not visiting his properties in Perth, Australia, or Majorca, Spain, he’s climbing Mount Kilimanjaro or traipsing around Antarctica’s Ross Ice Shelf. Two years ago Duncan called to suggest we begin a cross-county tour in the U.S. promoting a fitness plan for folks over 50 years old called Zest for Life. With the blessings of my wife, I met up with Duncan in Washington, D.C., after his flight from London and we set out in my Jeep heading west along I-70. The idea was to pitch our marvelous idea to aged couch potatoes. Of course, it all came to naught. Duncan managed to charm his way onto a morning television show in Pittsburgh and an earlier morning radio program in Wheeling, West Virginia, but no other media outlets showed interest. By the time we reached Columbus, Ohio, Duncan had had enough. We played a nice round of golf in Circleville, home of the world’s largest pumpkin festival, and Duncan flew home the next day. I drove back to K.C. mentally reviewing what this quixotic little adventure had cost. From a business standpoint it never had a chance, but making money was never the point. It was goofy and fun and as we parted ways we were already talking about on our next caper. That’s me on the left, Duncan on the right. Here’s my review of a book I particularly liked. The Clint Eastwood movie Invictus was based on it. On June 24, 1995, a miracle occurred on a rugby field in South Africa. A year earlier, nearly fifty years after apartheid ended with South Africa’s first free election, terrorist attacks by white and black extremists threatened to throw the country into chaos. Nelson Mandela was not an athlete. More than a quarter century of his 79 years had been spent in prison, most of it in an 8 by 10 foot cell. He knew little about the game of rugby and what he did know he detested for its racial and political implications. Against incredible odds, however, he used the sport to not only dispel distrust, fear and hatred between the races, but to bring redemption and pride to a white society long considered a pariah by the world community. This absorbing book by South African correspondent John Carlin transcends the genre of inspirational sports books by showing that a singular athletic event, as much as war or political opportunism, can transform the destiny of a nation. Mandela had been a prisoner on Robben Island for 27 years when pressure resulting from the world boycott and the threat of armed black resistance led to his release in 1993. Soon thereafter, President Paul de Klerk of the ruling conservative National Party, announced the target date of multi-race elections for April 1994 that would allow for the first time in South African history “one person-one vote”. With 80% of the nation’s population being black Mandela won in a landslide. It was an historic victory that had arrived after decades and thousands of lost lives, but Mandela understood better than anyone if the new South Africa was to survive he must extend the hand of reconciliation to his former enemies. Fortune dealt him that chance when the International Rugby Board took a chance by awarding the 1995 Rugby World Cup Tournament -like the Olympics, an event held every four years–to South Africa. Sanctions seldom work. If anything they have the reverse effect on the target by unifying the people to which they are aimed. But prior to Mandela’s release from prison one of the most effective weapons of the world boycott had been the refusal of the rugby playing countries, New Zealand in particular, to play the Springboks, South Africa’s national team. Pot bellied, Castle beer-swilling farmers of the Veldt as well as wine-sipping professionals in the cities wept angry tears as year after year they watched their beloved ‘Boks waste their best years in meaningless regional matches. Mandela, like most blacks, hated rugby because it was a “white’s only” game, and the Boks were the embodiment of supremacist pride. But he knew if his new government was to survive it must be as a unified nation. A politician through and through, he knew the way to political victory was to appeal to the heart, not the head. How better to reach the Afrikaner’s soul than through his ‘religion’? “One team, one country” became the slogan that propelled the remarkable events that John Carlin describes. It began with Mandela approaching the head of the rugby union, who in turn appointed a legendary player and enlightened thinker named Morne du Plessis to coach. Du Plessis worked hard to raise the political consciousness of the players, going so far as to insist that they learn to sing “Nkosi Sikelele iAfrika”, the longtime anthem of black resistance to apartheid. But it took Mandela to visit their practices and use his considerable charm to sway their charismatic captain, Francois Pienaar, into accepting that they must play not just for whites but all of South Africa. The bonding of these Afrikaner behemoths with the new president is just one of the many inspirational stories Carlin relates. The final chapters build to a thrilling crescendo when, having survived a close match with France, the Springboks take the field for the final against the heavily favored New Zealand All Blacks (named for the color of their uniforms). The dusty streets throughout the black townships as well as those in the leafy white suburbs were empty as an entire nation watched the broadcast from inside their houses, bars and clubs. Ellis Park stadium in Johannesburg was filled to capacity and when Nelson Mandela appeared on the field for pre-game ceremonies wearing the formerly detested Springbok rugby jersey, thousands of black, white and colored fans screamed their approval along with millions glued to their t.v. sets. The game itself was a bruising war of attrition and by the end of regulation the score was tied 9-9. A ten minute overtime followed, but if you wish to learn the result you’ll have to buy the book or wait to see the movie. Clint Eastwood has begun filming in South Africa with Morgan Freeman as Mandela and Matt Damon as Pienaar. I’ll give you a hint, however. When the game finally ended and the exhausted players had retreated to their dressing rooms, a television reporter asked the Springbok captain what it felt like to have 62,000 fans supporting them in the stadium.